Let’s do a 303 Aerospace Protectant review. This is my plastic and rubber trim dresser of choice. I’m surprised I didn’t do this years ago. More often than not, the best products are discovered by word a mouth. A friend of yours uses a new product to detail his car. You see the car, love it and ask what he used. It’s all downhill from there. That’s really how car detailing products become famous. I don’t really see them advertising on TV. Then you have forums, which technically work by word of mouth as well. 303 Protectant is used to protect plastic and rubber. It also adds life and color to the parts you apply it to. The best part of it however is that it does not leave a sticky shiny residue behind. In fact, you can hardly even tell it’s there. On tires, 303 Aerospace Protectant adds a deep black look. Since tires absorb so much protectant, they look completely matte, yet nice and black. This eliminates the problem of having all that sticky goo getting flung up towards your perfectly detailed car the second you drive away. Furthermore, it truly looks good. Unlike, the horrible newb look of tires with layers upon layers of shiny Armor-All. The other thing I love about 303 Aerospace Protectant is that you can use one product for all trim. 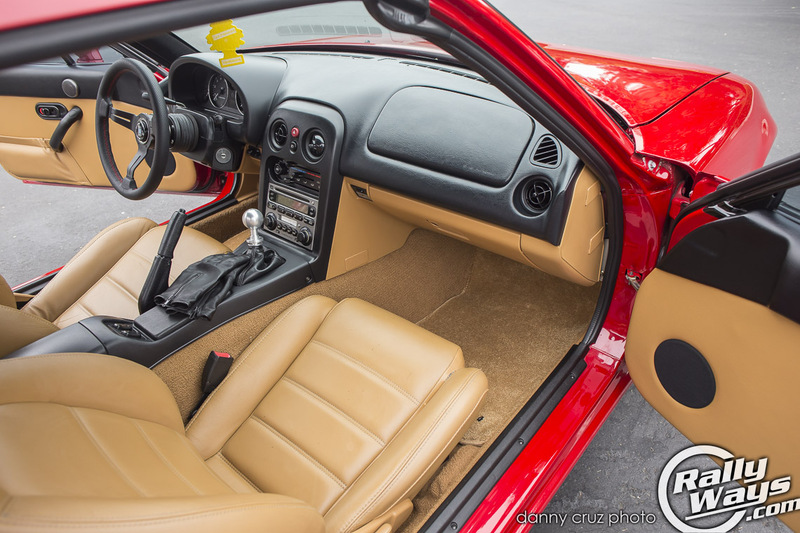 As much as I like 303 Protectant on the exterior rubber and plastic trim, I think I love it even more on the interior. This is the stuff I use for the interior dash and door panels of the RallyWays Miata. The interior plastic trim tends to absorb a lot less product than the exterior trim. There’s a point where it becomes saturated. At this point, you start getting a bit of a sheen from the inside panels. However, it’s not shine. It’s more of a classy sheen that shows how clean the parts are. It also depends on the materials. Vinyls tend to sheen more than the newer style of matte interior panels in more modern cars. 303 Aerospace Protectant also makes other great products. I use their 303 Fabric Cleaner and the 303 Fabric Guard. Both of those products are great for cleaning and waterproofing your fabric – Much like 3M Scotch Gard. However, those are products I use, just not as often. I find myself reaching for 303 Aerospace Protectant at every detail. I also use it for all my cars, inside and out. Oh, and I even use it for engine bay plastic and trims — Even for hoses and things you can see when you open the engine bay. 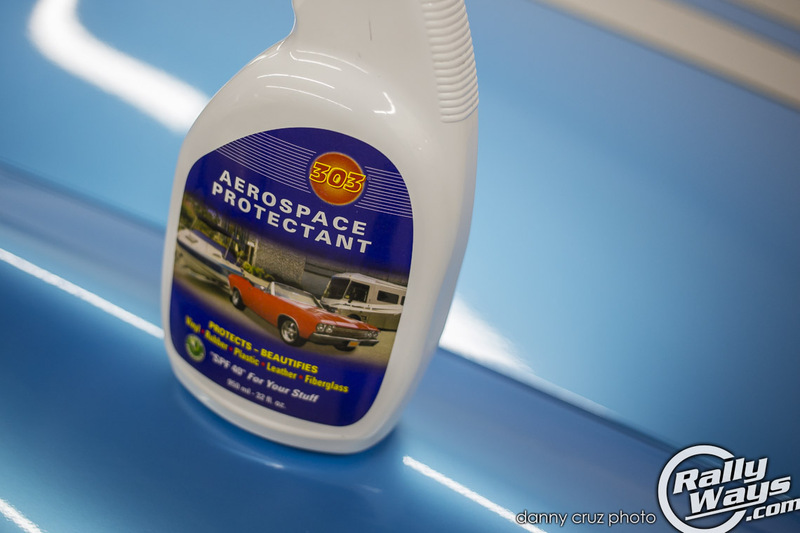 A friend of mine uses 303 Aerospace Protectant for the vinyl roof of a classic 1966 Lincoln Continental. Another friend uses it for his C6 Corvette and C4 ZR-1. Do yourself a favor and order a bottle of 303 Aerospace Protectant and find out what you’ve been missing. It really is THAT good. Check out the link below.